ROCK N ROLL SOCCER: Bringing the NASL to life "in all its spectacular glory and failure"
Bringing the NASL to life "in all its spectacular glory and failure"
A big thank you to the football literature web site Of Pitch & Page for a pertinent summary of Rock n Roll Soccer, and for the enthusiastic recommendation. It's nice to get a review a few months after the book has come out to remind everyone that it's still most definitely available. 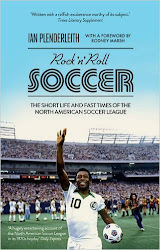 "Rock n Roll Soccer," they state, "takes a relatively unknown area of ‘soccer’ history and brings it to life in all its spectacular glory and failure." This was the first review to mention (and appreciate) some of the book's less conventional sections. In the site's words: "Plenderleith’s tone and structure is a great fit with the subject matter. Rock n Roll Soccer is full of amusing asides and dry wit, from the chapter [sub] titles – ‘Debit does Dallas’, ‘Learning from your alcoholic dad’ – right through to the ‘Fun Facts’ sections for each season. But best of all is the ‘Half-time’ lists section in the middle of the book, which features ’20 odd names in the NASL’ plus the ‘NASL Soundtrack’." As a former sub editor who took particular pride in his sub-titles (which rarely get any notice, or credit), I paid a lot of attention to breaking up the text in long chapters in an attempt to keep the reader interested. It's true that you'd have to be both a Smiths fan and a keen observer of the North American Soccer league to appreciate the sub-heading 'Toye With The Thorn In His Side', but every sub takes some satisfaction that his or her dreary job at the fag end of journalism can be livened up with some possibly clever reference that may be lost on the majority of people. I was also very pleased to see some love for the Half-Time section, hitherto unmentioned in most reviews. I wondered about the wisdom of including this part of the book, which was immensely fun to write, but which I thought might not fit. Perhaps it was the sort of thing that belonged exclusively online, being basically just a series of lists. 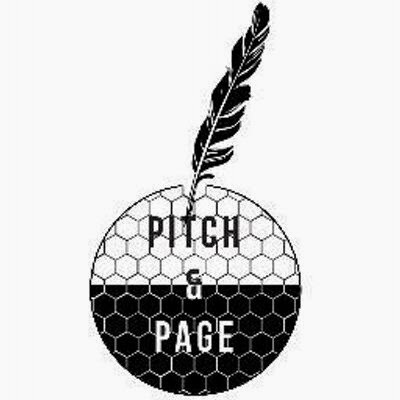 One editor at Icon was no fan of the NASL Soundtrack mentioned by Of Pitch & Page, and recommended cutting it. I could definitely see why, but in the end I was just too pleased with myself for claiming that Blondie's Detroit 442 was about "Debbie Harry's barely coded tactical advice to Detroit Express coach Ken Furphy to play four in midfield and two men up front. Harry's musically articulated guidance took the Express to the playoffs..." And so on.